You’ve done what you can to reduce your baby’s exposure to potentially harmful chemicals in your home. From baby furniture and diapers to skin-care and cleaning products, you've weighed the safety of your little one and the planet. But what happens when your baby goes to daycare? If you've been wondering how you're going to keep him extra-safe during those hours away from home, you're in luck: Green day care is already certified or in the works for certification in several states (see sidebar), and environmental groups have checklists to help you identify environmentally sound facilities. Even if no centers in your area pass muster, you might be able to talk providers into making some small and inexpensive changes that will ensure the safety of all the children in their care. What Is Green Day Care? indoor and surrounding air quality - how free from pollution is it? use of nontoxic cleaners and pesticidesuse of PVC-free plastics in toys, baby bottles, etc. no smoking on the premises and within sight of the children. Green day-care certification programs are fairly new and have only spread to some states, which leaves many parents without the option of just looking up a certified provider. Fortunately, many have taken it upon themselves to enforce green policies at their facilities. When choosing a day-care provider, you can do your own research to find non-certified but nevertheless green facilities. Here's what to look for. Check your state requirements for child-care facilities by visiting nrc.uchsc.edu/STATES/states.htm. These requirements also include standards for food, child-to-adult ratio and construction. Make a list of questions to ask when you visit the facility. For tips, check out the Oregon Environmental Councils Eco-Healthy Childcare checklist or the Indiana Department of Environmental Management 5-Star application as guides. Examples of questions include: What type of cleaners does the facility use? When was it built? If it's a pre-'78 building, how does it protect children from lead-paint exposure? What type of art supplies do the children use? Are air freshener or scented candles allowed? Are parents banned from leaving cars idling outside the building? Find out if the day care has been accredited by an independent agency, such as the nonprofit National Association for Family Child Care, the National Association for the Education of Young Children or the National Early Childhood Program Accreditation. 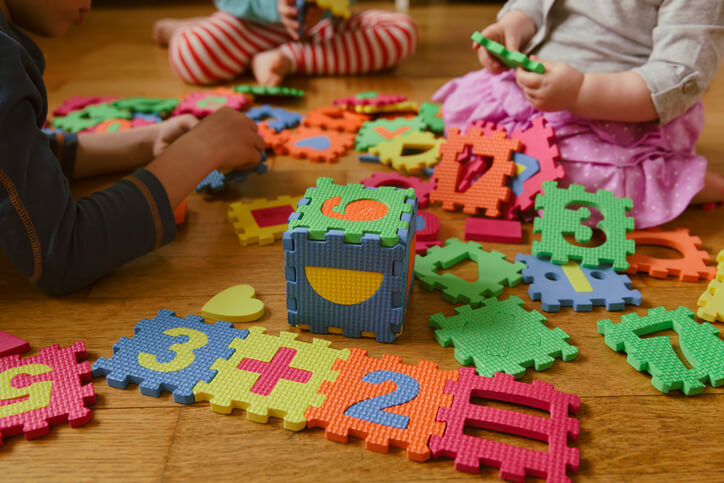 These organizations are working to improve the child-care profession by creating new standards that include the health and safety of children. If there are no green (or even greenish) day cares in your area, or if you already have a day-care provider, consider discussing some of your thoughts with them. You can suggest small changes that would make the facility safer for everybody. Switch from chlorine-based to peroxide-based bleach. It’s just as easy to find in the stores and is better for everybody’s lungs. Use nontoxic art supplies. See a list that’s approved by the Art & Creative Materials Institute here. Use PVC-free plastic toys and bottles. Stores like Walmart are expanding their offerings of non-PVC baby goods, so they're increasingly easy to find. Turn the day care into a shoe-free facility. That way less dirt and pollutants will be tracked into the building. Switch to mercury-free thermometers (and recycle the old mercury ones properly! ).